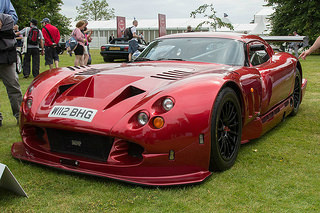 The Cerbera Speed 12 sports car, or TVR Project 7/12, its original concept name, was premiered at the 1996 Birmingham Motor Show, where its stand came to dominate the show. It was fitted with a 12-cylinder, 7.731 litre engine (hence the "7" and "12") and, according to TVR, would develop over 800 bhp, and produce a higher top speed than the McLaren F1 sports car. The engine was, in fact, a combination of two Speed Six AJP6, 6-cylinder units, each modified to full race specification, and connected by a single crankshaft to form a V12, double overhead cam unit, connected to a specially designed six speed gearbox. Only five of these engines were ever built. This engine was actually capable of producing close to 1,000 bhp, although confirmation of this never took place, primarily due to the lack of appropriately robust test equipment. It is interesting to note that the engine block was constructed of steel instead of the expected aluminium or even cast iron. The race inspired chassis of the Speed 12 bore no relationship to that of the Cerbera, and consisted of a steel role cage and aluminium honeycomb floorpan. The body was made of carbon fibre, and was fitted with a massive spoiler and huge skirts, which created the necessary downforce. 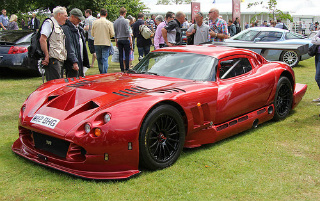 The car was designed to be the world's highest performing road car, as well as the basis of a GT1 class endurance racer. 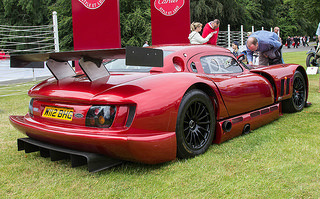 In 1998, it was duly designated the TVR Speed 12 sports car, and it was anticipated that this GT1 racer would be entered in the Le Mans 24 hour event. Although this did not materialise, it did compete in the FIA GT Championship before rule changes caused it to be made obsolete by tjhe introduction of some purpose built racers, such as the Porsche 911 GT1. In order not to waste the valuable experience gained so far with the Speed 12 on the track, it was decided to create a road going version. 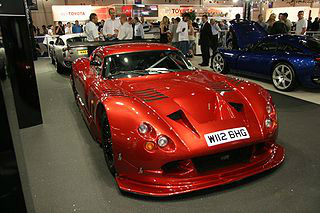 Modifications of the Speed 12 were finalised in 2000, when it was designated the TVR Cerbera Speed 12 sports car. It used the same engine as before, whilst the weight of the car was kept to a maximum of 1,000 kilograms. The plan was to produce a car which was capable of exceeding 240 mph, and therefore outperforming the McLaren F1. The new car would be built alongside a new GT2 class race car, which was entered in the British GT Championship where it had some success, winning several races. However, this racer was prone to suffer from reliability problems, which caused it to prematurely retire during some races. On the other hand, by this time, the road version was now available and, priced at £245,000, it was to be the most expensive TVR ever produced. The engine of the race variant was limited to an output of 675 bhp, by means of the intake being restricted, as required by race regulations. However, this did not apply to the road car, so its development could be completed unimpeded. In order to assess the likely engine output of the road variant, each half of the unit was tested separately, so producing 480 bhp, which meant that the output of the unit as a whole was a staggering 960 bhp. The car was fitted with 14.9 inch vented disc brakes at the front, and 10.7 inch discs at the rear. With a compression ratio of a massive 12.5:1, it developed 960 bhp at 7250 rpm, and 650 ft/lbs of torque at 5750 rpm, had a top speed of 240 mph, a 0-60 mph time of 2.9 secs, and a 0-100 mph time of 6.3 secs. However, Peter Wheeler, the owner of TVR at that time, tested the finished sports car and concluded that, as a road car, it was simply too powerful, and hence too difficult to drive, and so the planned production was cancelled. No doubt he realised that demand for such an extreme road car, at that price, would be very limited. The prototypes were then dismantled, and used as spares for the existing Speed 12 race cars. Finally, in August 2003, one of the prototypes was rebuilt, and advertised for sale to an appropriate customer, as chosen by Peter Wheeler. The body used, made of carbon fibre, was from one of the GT racers, and coupled with additional work on the engine and engine management system, the resulting car, registration W112 BHG, would be even faster on the track owing to the increased downforce at the rear with the racing body. Two years later, the sports car was road tested by a premier motoring magazine, which described it as: "terrifyingly quick".